That's right, this bread doesn't quite know what it is, but it has a feeling it's not from around here. It started with an entire vat of leftover Moroccan Carrot Salad that, no matter how much eating occurred, never seemed to diminish. One way we know of to get rid of such obstinate vegetables is to plop them into some kind of baked good. So there you have it. The carrot salad is already flavored, macerated with sugar and lemon juice, and spiked with a little kewra water. I'd seen a recipe or two that suggested vanilla as a subsitute for kewra, although they do completely different things. But I figured it could go the other way around in this bread. And it did. And it was great. Consumed in one and a half days around here, this is a great thing to do with leftover carrot salad. Of course, you don't have to wait for leftovers. You could just grate some carrots and not even necessarily bother macerating them at all. The bread ended up having this incredible, crunchy, almost caramelized crust, while staying nice and juicy (I can explain) inside. Juicy being, by the way, R's term because there's just something about the word "moist" that makes me cringe. Of course *juicy* doesn't make a bit of sense, but it's kind of funny. And I like the idea of a juicy carrot bread. Preheat the oven to 350 and grease an 8" x 5" loaf pan. 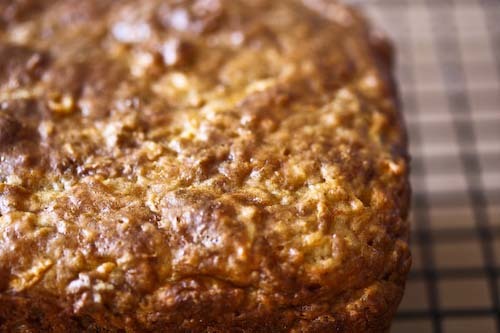 In a bowl, combine the flour, carrots, sugar, cardamom, baking soda, baking powder and salt. Mix to combine. In a separate bowl combine the rest of the ingredients and stir to combine those as well. Pour the wet ingredients into the dry ingredients and stir just until combined. Pour into the prepared loaf pan and bake for 45 - 50 minutes. This carrot bread sounds delicious. Thanks for posting. At first glance, I thought that said "low carrot fat bread", which I thought was a bit odd. The actual bread and recipe look great. 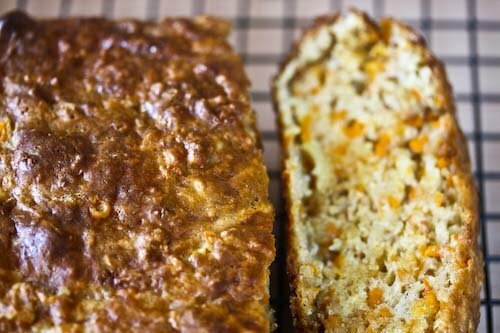 Carrot bread with a bit of flare, I like it! Looks so healthy and good. Thanks for sharing. I hope you wouldn't mind having our Foodista readers directed to your blog. If it's okay, just add your choice of widget to this post and you're all set! Love to try this recipe.Looks deliciously good.